This article is about documents produced by standards organizations. For other uses, see International standard (disambiguation). International standards are technical standards developed by international standards organizations. International standards are available for consideration and use worldwide. The most prominent organization is the International Organization for Standardization (ISO). International standards may be used either by direct application or by a process of modifying an international standard to suit local conditions. The adoption of international standards results in the creation of equivalent, national standards that are substantially the same as international standards in technical content, but may have (i) editorial differences as to appearance, use of symbols and measurement units, substitution of a point for a comma as the decimal marker, and (ii) differences resulting from conflicts in governmental regulations or industry-specific requirements caused by fundamental climatic, geographical, technological, or infrastructural factors, or the stringency of safety requirements that a given standard authority considers appropriate. International standards are one way of overcoming technical barriers in international commerce caused by differences among technical regulations and standards developed independently and separately by each nation, national standards organization, or company. Technical barriers arise when different groups come together, each with a large user base, doing some well established thing that between them is mutually incompatible. Establishing international standards is one way of preventing or overcoming this problem. The implementation of standards in industry and commerce became highly important with the onset of the Industrial Revolution and the need for high-precision machine tools and interchangeable parts. Henry Maudslay developed the first industrially practical screw-cutting lathe in 1800, which allowed for the standardisation of screw thread sizes for the first time. Maudslay's work, as well as the contributions of other engineers, accomplished a modest amount of industry standardization; some companies' in-house standards spread a bit within their industries. 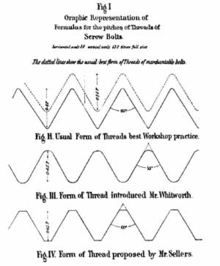 Joseph Whitworth's screw thread measurements were adopted as the first (unofficial) national standard by companies around the country in 1841. It came to be known as the British Standard Whitworth, and was widely adopted in other countries. By the end of the 19th century differences in standards between companies were making trade increasingly difficult and strained. The Engineering Standards Committee was established in London in 1901 as the world's first national standards body. After the First World War, similar national bodies were established in other countries. The Deutsches Institut für Normung was set up in Germany in 1917, followed by its counterparts, the American National Standard Institute and the French Commission Permanente de Standardisation, both in 1918. By the mid to late 19th century, efforts were being made to standardize electrical measurement. 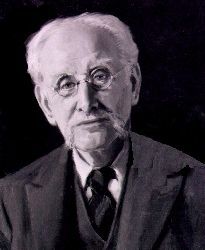 An important figure was R. E. B. Crompton, who became concerned by the large range of different standards and systems used by electrical engineering companies and scientists in the early 20th century. Many companies had entered the market in the 1890s and all chose their own settings for voltage, frequency, current and even the symbols used on circuit diagrams. Adjacent buildings would have totally incompatible electrical systems simply because they had been fitted out by different companies. Crompton could see the lack of efficiency in this system and began to consider proposals for an international standard for electric engineering. In 1904, Crompton represented Britain at the Louisiana Purchase Exposition in St. Louis as part of a delegation by the Institute of Electrical Engineers. He presented a paper on standardisation, which was so well received that he was asked to look into the formation of a commission to oversee the process. By 1906 his work was complete and he drew up a permanent constitution for the first international standards organization, the International Electrotechnical Commission. The body held its first meeting that year in London, with representatives from 14 countries. In honour of his contribution to electrical standardisation, Lord Kelvin was elected as the body's first President. The International Federation of the National Standardizing Associations (ISA) was founded in 1926 with a broader remit to enhance international cooperation for all technical standards and specifications. The body was suspended in 1942 during World War II. After the war, ISA was approached by the recently formed United Nations Standards Coordinating Committee (UNSCC) with a proposal to form a new global standards body. In October 1946, ISA and UNSCC delegates from 25 countries met in London and agreed to join forces to create the new International Organization for Standardization (ISO); the new organization officially began operations in February 1947. ^ "BSI Group Annual Report and Financial Statements 2010, page 2" (PDF). Retrieved 2012-04-03. ^ Johnson, J & Randell, W (1948) Colonel Crompton and the Evolution of the Electrical Industry, Longman Green. ^ Chris K. Dyer; Patrick T. Moseley; Zempachi Ogumi; David A. J. Rand; Bruno Scrosati Newnes (2010). Encyclopedia of Electrochemical Power Sources. p. 540. ^ IEC. "1906 Preliminary Meeting Report, pp 46–48" (PDF). The minutes from our first meeting. Retrieved 21 October 2012.